The arms control horizon is both grim and complex, bogged down by a triple tangle of geopolitical, strategic and technological factors while reflecting the depth and difficulty of today’s security dilemmas. The continued inability to move forward risks deepening them, yet even small advances could signal and encourage an easing of global tensions. In the 1970s, Cold War arms control negotiations were a key element of US-Soviet détente. When relations deteriorated, arms control stalled and became an irritant. But as change in the Soviet Union unfolded and the Cold War came to a close, arms control and arms reductions were suddenly never more popular or attainable among the international powers with most at stake. On the nuclear front, two US-Soviet treaties set the pace. The 1987 Intermediate Nuclear Forces (INF) Treaty removed all ground-launched nuclear and conventional missiles (and their launchers) of any range from 500 to 5,500 kilometers. The Strategic Arms Reduction Treaty (START), signed in July 1991, reduced each side to 6,000 strategic nuclear warheads on a maximum of 1,600 delivery vehicles (bombers and missiles). As the Soviet Union broke up, Belarus, Kazakhstan and Ukraine renounced nuclear weapons ambitions (as did post-apartheid South Africa in the course of its own transformation). Although the negotiation of a follow-on treaty took almost two decades, in 2010 Russia and the US signed New START, limiting each side to 1,550 strategic nuclear warheads deployed on 700 strategic delivery systems. Overall, the number of nuclear weapons worldwide fell from some 65,000–70,000 at peak to 14,945 at the end of 2016 (as per latest reliable data point). Conventional arms control was equally dramatic. The 1990 Treaty on Conventional Armed Forces in Europe capped at equal levels the numbers of heavy weapons deployed between the Atlantic and the Urals by the states of NATO and the Warsaw Pact, binding the latter states even after the Pact itself fell apart. This was not all. Other arms control milestones of the period include the Chemical Weapons Convention signed in 1993, the Comprehensive Nuclear-Test-Ban Treaty in 1996 and the Arms Trade Treaty in 2013. Today’s scene is rather different. The Comprehensive Test-Ban Treaty has not come into force because a number of key states have not ratified it, including the US, China, Pakistan, India and North Korea. The US and Russia accuse one another of violating the 1987 INF Treaty. Though New START is being implemented, its agreed expiration date is 2021, and there are no current talks on its replacement nor any in sight. That means that there are currently no meaningful nuclear arms reduction talks involving the leading nuclear powers. The idea of Russia and the US opting for an unrestrained nuclear arms race seems improbable due to its expense and peril. But that view rests on the belief or hope that they will prefer moderation; it does not rest on evidence of a practical commitment to further arms control. As for conventional weapons, Russia pulled out of the Conventional Forces in Europe (CFE) Treaty in an extended process that concluded in 2015. The core Russian argument was that NATO’s enlargement meant that the equity of the original caps on equipment numbers had been lost. And furthermore, despite repeated efforts by the Organization for Security and Cooperation in Europe (OSCE), there is no progress and scant active discussion of confidence and security building measures. What some may regard as the biggest failure of arms control lies outside of the normal negotiating arenas of such agreements. North Korea’s successful programs of ballistic missile and nuclear weapons development, despite nine UN Security Council resolutions imposing sanctions, have frustrated a major international non-proliferation effort. North Korea probably has a current arsenal of some 20 to 30 deployable nuclear warheads. It has the irrefutable capacity to hit regional powers with ballistic missile strikes and probably the ability to strike certain American targets. It is more than likely that it will be able to deploy nuclear missiles capable of reaching targets in the continental United States within an uncomfortably short period of time. On the other hand, impatience at the retention of nuclear weapons by a handful of states has been steadily growing among many non-nuclear weapon states. The central bargain of the 1970 Nuclear Non-Proliferation Treaty (NPT) was that the nuclear have-nots would remain have-nots while the nuclear haves took steps to divest themselves of their nuclear weapons. The US and Russia have dramatically reduced their arsenals but have shown no signs of readiness for complete elimination, except in occasional rhetoric such as President Barack Obama’s Prague speech in 2009. More tersely, Trump has reiterated the dream of a nuclear-free world but, in the meantime, like his predecessor in the White House, has opted to remain energetically engaged in the nuclear weapons business. For most of the non-nuclear weapon states, this is simply not good enough, which is why 122 of them voted for the Treaty on the Prohibition of Nuclear Weapons – usually known as the “nuclear ban” – and 50 signed up on the first day it was open for signature. The combination of a sense that arms control does not work, does not go far enough and has weak prospects weakens the will and willingness to support the current nuclear non-proliferation regime. It is jeopardized even more when the US president persistently casts doubt on a non-proliferation measure that is working effectively – the Joint Comprehensive Plan of Action, better known as the “Iran nuclear deal,” which efficiently albeit temporarily blocks Iran’s path to nuclear weapons. A good part of the explanation of why arms control has reached this point of stasis lies in Russia’s relationship with the US and its allies. Many of arms control’s most significant difficulties have been symptoms of a larger ailment in the global body politic. The infection is long-lasting and has taken hold slowly. Long before Crimea and Ukraine, the Obama administration wanted to push the reset button in US-Russia relations, which had crashed after the war in Georgia in August 2008. But even before Georgia, arms control had been limping as Russia sought a return to a position of global strength and saw many of the arms control agreements to which it was then bound as products of earlier Russian weakness. Even in this atmosphere, however, it was still possible to agree to New START in 2010, which may in part be due to Russia’s view that equality was much more firmly inscribed in this treaty than in the CFE, for example. This hint that the prospects of arms control are not governed purely by a priori politics – that strategic considerations also play a part – is reflected in the case of the INF Treaty, about which Russia has been increasingly uncomfortable since 2007. That was the year when discussion surfaced within NATO about placing ballistic missile defenses in Eastern Europe. This move was seen as a potential threat to Russia’s ability to sustain its nuclear deterrence; thus, in 2008 it began testing ground-launched cruise missiles (GLCM) capable of a range banned by the INF Treaty. It is not possible to aver with certainty that, absent missile defense, Russia would not have developed and tested GLCMs; history is full of ex post rationalizations and is far from devoid of weapons technologies looking for a role and rationale. But it is at least a possibility worth acknowledging that, as so often is the case in the arms race, one side’s defensive measures look offensive to the other. In short, with positive or negative effect, choices of military strategy can have a political impact – and arms control considerations can either be a part of the choice or fall victim to the impact. The challenges for arms control that are set by the politics of US-Russian relations and the impact of strategic choices are exacerbated by current developments in arms-related technologies. A key example is the increasing feasibility of autonomy in weapon systems. It is now well within the bounds of technological possibility that weapon systems with autonomy in both acquiring and striking targets will be deployed. It is by no means beyond the bounds of possibility that such weapons systems could be deployed in an offensive as well as defensive mode and consequently used in fast-paced contexts of combat. As extraordinary as such scenarios may sound, weapons systems capable of autonomous decision-making vis-à-vis targeting are no more unthinkable than self-driving cars. This prospect raises discomfiting questions about what used to be called the Laws of War, now known as International Humanitarian Law. Under the Geneva Convention (Article 36 of Additional Protocol 1), parties are bound to review the legality of all new weapons, means or methods of warfare before they are used in armed conflict. How would autonomous weapons respect such laws? Would they – could they – actually be required to? An arms control framework has been found for discussing these weapons, but implementation has been slow. Few governments have defined positions and discussions have thus far been purely informal. It is unclear if or when negotiations will start or what their objective would be. The question must be whether the pace of arms control will match the pace of arms development. Uncomfortable questions also emerge over cyber security. While it has become a cliché to say that, in the next war, the first attack will occur in cyberspace, the more uncomfortable thought is that the first attacks have already occurred. This line of thinking suggests that cyber warfare erodes the boundary between war and peace. 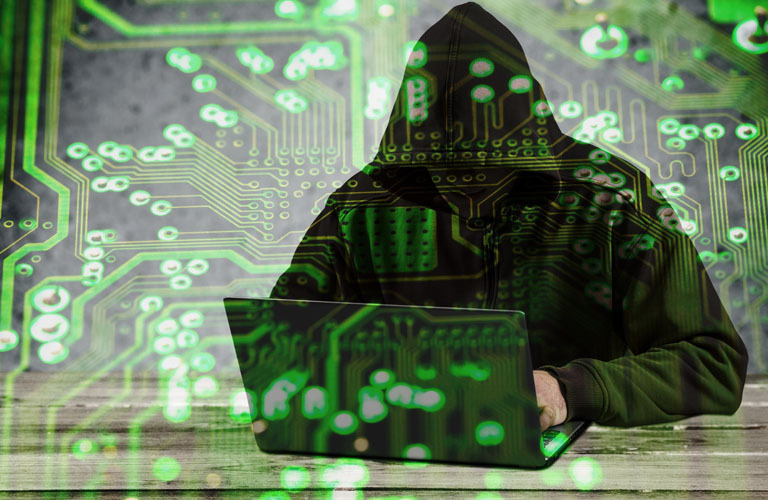 The cyber vulnerability of critical infrastructure ranging from health systems, finance and public transport to energy generation and communications is recognized as an essential issue for national security. Its potential impact explains some experts’ perspective that cyber warfare will take precedence – or already does take precedence – over kinetic warfare. And, of course, there are nightmare threats such as cyber attacks taking over the kinetic warfare abilities of a state, including hacking into largely autonomous weapon systems and into the control of nuclear weapon systems. This eventuality would seem to necessitate international regulations to bring these fields of cyber espionage and cyber terrorism under control. All states have an interest in limiting this sphere of human activity, yet current technology developments make abundantly clear the profundity of the problems we face in terms of arms control, especially when the politics of arms control exhibit so little hope. There are feasible responses to all the challenges facing arms control. The difficulties with the INF Treaty in an age of missile defense could be brought into the realm of negotiation in lieu of a sterile blame game. New START can be extended beyond 2021 and negotiations on a replacement could begin now. These measures would help quell the impatience of the non-nuclear weapon states, as would other limited steps such as those that address nuclear safety and the availability of fissile materials. These actions could reestablish the unity of purpose needed to prevent further nuclear proliferation. Negotiations on autonomy in weapons systems can be accelerated and the development of the technology slowed. Additional resources can be funneled into cyber security while the capacities of this field are harnessed for improved verification of other arms control measures. These and many other positive developments can be achieved on the single and simple condition that the two central players – the US and Russia – both decide they want to. 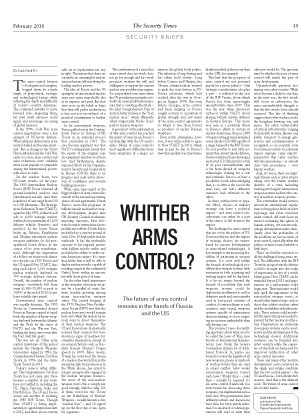 And that is the ultimate issue: The future of arms control lies in their hands.